An interesting disagreement occurred this week between Martin Sandbu and the Economist, which prompted a subsequent letter from Philippe Legrain (see also Martin again here). The key issue is whether the German current account surplus, which has steadily risen from a small deficit in 2000 to a large surplus of over 8% of GDP, is a problem or more particularly a drag on global growth. To assess whether the surplus is a problem, it is helpful to discuss a key reason why it arose. I have talked about this in detail many times before, and a similar story has been told by one of the five members of Germany’s Council of Economic Experts, Peter Bofinger. A short summary is that from the moment the Eurozone was born Germany allowed wages to increase at a level that was inconsistent with the EZ inflation target of ‘just below 2%’. We can see this clearly in the following chart. 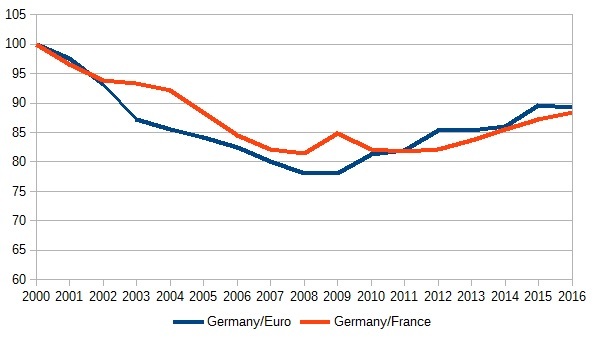 The blue line shows German unit labour costs relative to its competitors compared to the same for the Euro area average. Obviously Germany is part of that average, so this line reduces the extent of any competitiveness divergence between Germany and other union partners. By keeping wage inflation low from 2000 to 2009, Germany steadily gained a competitive advantage over other Eurozone countries. At the time most people focused on the excessive inflation in the periphery. But as the red line shows, this was only half the story, because wage inflation was too low in Germany compared to everyone else. This growing competitive advantage was bound to lead to growing current account surpluses. However that in itself is not enough to say there is a problem, for two related reasons. First, perhaps Germany entered the Eurozone at an uncompetitive exchange rate, so the chart above just shows a correction to that. Second, perhaps Germany needs to be this competitive because the private sector wants to save more than it invests and therefore to buy foreign assets. There are good reasons, mainly to do with an ageing population, why the second point might be true. (If it was also true in 2000, the first point could also be true.) It makes sense on demographic grounds for Germany to run a current account surplus. The key issue is how big a surplus. Over 8% of GDP is huge, and I have always thought that it was much too big to simply represent the underlying preferences of German savers. I’m glad to see the IMF agrees. It suggests that a current account surplus of between 2.5% to 5.5% represents a medium term equilibrium. That would suggest that the competitiveness correction that started in 2009 has still got some way to go. Why is it taking so long? This confuses some into believing that the 8% surplus must represent some kind of medium term equilibrium, because surely disequilibrium caused by price and wage rigidities should have unwound by now. The answer to that can also be found in an argument that I and others put forward a few years ago. From this perspective, does that mean that the current excess surpluses in Germany are a drag on global growth? Only in a very indirect way. If higher German wages, or the means used to achieve them, boosted demand and output in Germany then this would help global growth. (Remember that ECB interest rates are stuck at their lower bound, so there will be little monetary offset to any demand boost.) The important point is that this demand boost is not so that Germany can help out the world or other union members, but because Germany should do what it can to correct a problem of its own making. Resistance to nominal wage cuts becomes a much more powerful argument for a higher inflation target in a monetary union where asymmetries mean equilibrium exchange rates are likely to change over time. The rule in a currency union is very simple. Once we have achieved a competitiveness equilibrium, nominal wages should rise by 2% (the inflation target) more than underlying national productivity. I frequently get comments along the lines that setting wages lower than this improves the competitiveness of the Eurozone as a whole. This is incorrect, because if all union members moderate their wages in a similar fashion EZ inflation would fall, prompting a monetary stimulus to bring inflation back to 2% and wage inflation back to 2% plus productivity growth. If it wasn't for the Euro, this issue would have just sorted itself out automatically. Exchange rates would have shifted to increase German wages relative to those in the rest of the world. Regarding the second footnote, aren't the comments you get incorrect also because the exchange rate of the Euro would adjust, thus negating any competitive advantage? If Germany hasn´t done much to help until now, it´s doubtful they will going forward. "Over 8% of GDP is huge, and I have always thought that it was much too big to simply represent the underlying preferences of German savers." 25% of these 8% can simply be explained by energy prices: Around 2012, Germany paid almost 100 billion EUR for imported oil, NG and coal. In contrast, the costs were only 30 billion in 2016, this means that more than 2% of GDP are saved by low price of oil and NG, nothing Germany can influence in the short term. "a successful attempt by Germany to undercut other Eurozone members before the GFC"
the damage was inflicted by these countries themselve. Without any doubt, the internal devaluation in Germany contributed, too. Now the interesting question (again)is, how do you handle different social cohesion in the Euro zone countries? Why do you not suggest internal devaluation in the southern European countries? Well, the high unemployment rate in the first half of the 2000s might have played a role too? Remember the "sick man of Europe"? 10% unemployment (German definition of unemployment) might have depressed wage inflation a tad. That being said I do agree with you that the situation is now different. And the 8% surplus is clearly too high. As you know this huge surplus is not perceived in Germany as a problem but as a virtue. Also Mr Schäuble explained that since another crisis is coming, Germany has to get prepared: it should not just run a balance budget but decrease its debt. Now he will probably be gone in a few months but redent articles in the press mentioned possible successors who did not look less crazy but more. By the way, I understand that the UK and US are enough to keep you busy but what do you think of the fabulous plans of the new French government? It seems like France is catching up with the fashion of 15 years ago (Blair, Schröder). Labour reforms will likely push wages down and the government's top priority is to reign in the deficit. Isn't it a recipe to kill growth just as it is returning? I'm all for higher wages for German workers to solve the German trade surplus situation. But then, I worry that the argument might get flipped around to say that American workers need to take pay cuts to solve the US trade deficit situation. Is that reasonable? In what sector in particular must the wage in Germany increase? Do you mean in the sectors where German exports are disproportionately competitive? And how can the government achieve that - do they have direct power to do so in the private sector? German supply chains increasingly are extending into Poland, Slovakia, Hungary and the Czech Republic, where wages are rising more rapidly than in Germany itself. Only Slovakia is within the Eurozone. Will this tend to ameliorate the situation relative to Southern Europe? What is the effect of the large capital investments by German companies in East-Central Europe? And why is capital flowing in that direction, rather than, say, Greece?